Hollywood is not great when it comes to portraying the real world of business. It tends to focus on extreme characters in extreme situations, as you’d expect. Just occasionally, though, a movie tells a story that most of us with an interest in the world of work can enjoy, and even gain something from. The Intern is one such film for me. First of all, I love the idea of senior interns. This idea taps into my concerns about how experience in the workplace is largely undervalued. I’ve never heard of this actually happening except, I suppose, in the voluntary sector, but Robert De Niro’s character, Ben, demonstrates exactly what is lost when older employees are written off. He brings calm and offers wisdom because he’s seen it all before and he’s not overwhelmed by change. To think that when you reach a certain again you are no longer capable of adapting has always seemed ludicrous to me. Some find change easier than others, some embrace it while others resist it, and it doesn’t matter how old you are. 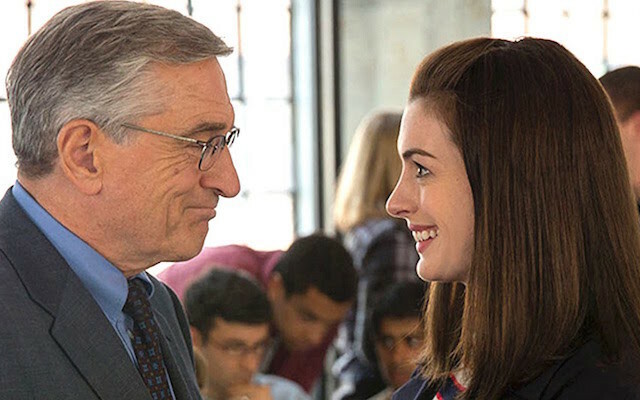 Ben (Robert De Niro) and Jules (Anne Hathaway) learning from each other in The Intern. If you are aware of any senior intern schemes I’d love to hear about it. Please leave a comment. Another point made by the film is that it’s not specific technical knowledge that is needed, even in a high-tech business. Obviously, this depends on the role, but so many times have I read job descriptions asking for industry experience when clearly it is not required. Often it’s used as a tool to reduce the number of applications, but I would argue that it’s a bad way of doing so, because there’s something lost when organisation exclude those from outside their sector. Inbreeding is not healthy. However, the really important message I thought the film made was to do with the way women entrepreneurs, and for that we can assume all senior women executives, often feel they are making a sacrifice to fulfil their business dream. What man would worry over his right to be committed to his work the way Jules (Anne Hathaway) does? The movie asks why women are even in a position where they question their choice to be the hard working mum with the stay-at-home husband. Finally, another point the film makes that is relevant to everyone at work: eat well, sleep well, exercise and make time for friends and family. That’s how to ensure you perform at your best at work. I very much enjoyed The Intern and if none of this has persuaded you to see it, then I’ll just add that there’s a very nice neck massage scene too. c) get on with it! The third is certainly true, but a bit trite so I won’t comment on that. If you’ve known me for a while you will know how important I think networking is. People who are out of work often find it difficult to network if they haven’t been active networkers during their career, because they haven’t accumulated much social capital, and this makes it difficult to ask for help. That’s why I always encourage clients to make time to network when they are in work instead of burying themselves completely in the new job. Networking is part of working. It’s how we become effective at work and is not simply done for personal benefit. If you don’t network you’re not doing your job properly. The first point also interests me very much. Of the senior business leaders and business owners I have met, the smart ones are those who openly admit to not knowing everything and who have carefully recruited people with complementary skills to run the show for them. One even happily talks about bringing in much cleverer people than himself. These people claim not to be smart, but actually they are the smartest. Maybe not in terms of IQ, but certainly in terms of EQ. In fact I’d argue that emotional intelligence is far more important for a business leader than IQ. Contrast those leaders with entrepreneurs and senior managers who are either so insecure that they recruit people who will make them look clever, or are such control freaks that they do everything themselves. Either way the organisation will suffer. Is it easy to be a “smart” leader as I have described? No, is the short answer. It takes self-awareness, humility and confidence. Self-awareness to understand where the gaps lie between the capability you have and the capability the organisation needs. Humility to know that it’s impossible to build a substantially sized business on your own. Confidence to know that by doing all this you are not going to be considered a talentless waste of space but instead a leader of talent. Interestingly for me as a counsellor as well as career coach, humility and confidence grow out of self-awareness. When people understand themselves to a level at which they can acknowledge and accept their weaknesses, humility follows, and then so does personal confidence. Not only that, but of course knowing your weaknesses is the first step on the journey of managing them. All of which ties up with another of the pieces of advice given by the CEOs questioned by the BBC: Learn from your mistakes. Yes, I’m talking to you, sitting over there in the corner playing Candy Crush Saga. Don’t think you haven’t been spotted. I do feel sorry for Nigel Mills. Sort of. I’m willing to bet that the majority of readers of this newsletter have, at some time if not regularly, been bored in a meeting and decided to check their emails. I would even go as far as to say that a few of you have played games when stuck in a meeting. One of the problems of the modern world of work is that there are just too many meetings, and they go on far too long. I was in a meeting this week and the convenor, only half joking, suggested that it would be over and done with a lot more quickly if he removed the chairs. An idea I’ve heard suggested before and not a bad one. We’re obsessed with meetings, and they are usually not efficient. Think about it. Eight people in an hour long meeting. That’s a working day right there, but they are not all working. OK, there is a value in a group of people sharing ideas and bouncing off each other, but most meetings are not like that. Most meetings are a series of one to one conversations where people go round the table reporting to the chair on something or other. Do the rest of the participants really need to be there or can those reports be shared in some other way? Yet it’s more than just boredom that drives some people to their mobile phones. There are many who express their sense of being ignored or undervalued by passive withdrawal, by which I mean they deliberately and obviously detach themselves from the group. I’m not saying that Nigel Mills falls into this category. Maybe he really was bored during the committee session. Nonetheless, to explain his behaviour as the result of boredom would certainly be the politicians way of handling it. There can’t be many who would deny that they might find sitting through a tedious hearing as boring, so he’d attract the “he’s only human just like the rest of us” vote. It’s a much better claim to make than “Nobody was interested in what I had to say so I decided to draw attention to myself by playing with my phone”. That response is only going to result in 60 million citizens clamouring for his resignation as yet another immoral, egotistical MP. Whatever the real reason, he wasn’t the first and he won’t be the last because many, many meetings are unnecessary wastes of time. But Candy Crush Saga? Really?